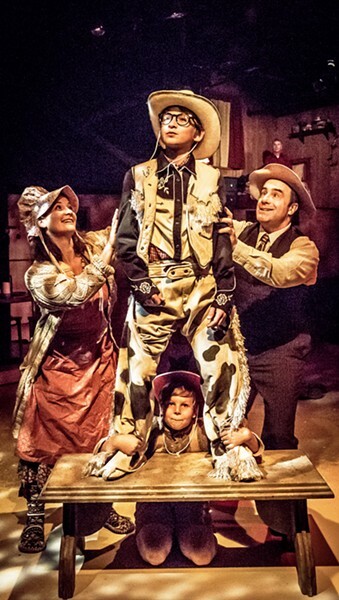 The play A Christmas Story will be onstage at the San Luis Obispo Repertory Theatre through Dec. 23. Tickets range from $20 to $39. Visit slorep.org for tickets and more information. There hasn't been a Christmas, or heck, a day, with a decent amount of snow on the ground in San Luis Obispo County since before I was born, but even the Central Coast has its little tells that the holiday is fast approaching. For me, one of those signs is the opening of the San Luis Obispo Repertory Theatre's production of A Christmas Story, directed again by managing artistic director Kevin Harris. The classic holiday favorite is back in town for its fifth consecutive year now. The play, by Philip Grecian, is based on both the 1966 novel and the 1983 film by Jean Shepherd. 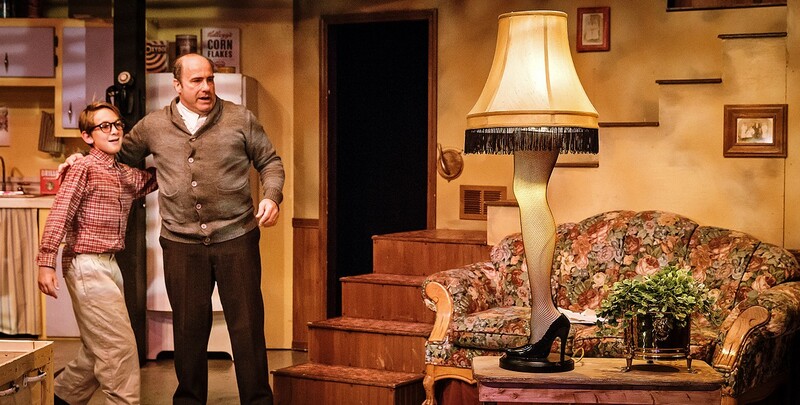 FRAGILE Ralphie (Coen Carlberg, left) is in awe as his father (Seth Blackburn) unpacks his "award" from a contest, the highly controversial leg lamp, in A Christmas Story. It is 1940 in Indiana and, as the now older narrator Ralph Parker (Don Stewart) recounts, "Christmas was on its way. Lovely, glorious, beautiful Christmas, upon which the entire kid calendar revolved." And all young Ralphie Parker (Coen Carlberg) wants to see under the tree is a Red Ryder BB gun. Naturally, when he blurts this out, his mother's (Alicia Klein) now famously classic response is, "You'll shoot your eye out." And so Ralphie sets about other means, from conducting a propaganda mailer campaign to going directly to the big guy (Santa) himself, to obtain his much-coveted wish list item. RED RYDER In his mind, if gifted a Red Ryder BB gun for Christmas, Ralphie (Coen Carlberg, center) dreams that he would transform into Ralphie the Kid, a hero capable of protecting his mom (Alicia Klein), dad (Seth Blackburn), and little brother, Randy, (Kyan Vander Weele) from all sorts of bad guys. The set is simple but resplendent, taking place almost entirely in the Parker family home, with multicolored Christmas lights outlining the edges giving us a peek into the kitchen, living room, and Ralphie's room. Later in the show, a few benches transform the set into Ralphie's classroom and, finally, the addition of a giant slide takes us to the department store where Ralphie finally gets to make his request to Santa in person. The classic story is given fresh life, in part by the addition of new cast members. Given that most of the show's characters are children, the cast naturally ages out every few years or so. Carlberg is earnest and charming as Ralphie. Kyan Vander Weele convincingly portrays the annoying, oblivious little brother to a tee. A real genuine sweetness shines through in London Raftery as she plays Esther Jane, who crushes on Ralphie, oblivious to his obvious scorn for her affection. And Drew Vander Weele, who previously played the role of Ralphie's school chum, Schwartz, has now been promoted to the part of the villainous, yellow-eyed Scut Farkus, the ominous bully feared by all kids. Pacific Conservatory Theatre actor and instructor Stewart returns to reprise his role as the narrator, a grown-up Ralph, giving a sense of credibility and comfort to the tale in his delivery. Arts Writer Ryah Cooley is firmly on team "You'll shoot your eye out." Contact her at rcoooley@newtimesslo.com.